Hartford, and the greater Hartford region, is at an infrastructure turning point. A large amount of our state’s infrastructure is approaching major renovation or reconstruction. It is exciting to see the focus at the national, state, and local level turning to sustainable and safe human scale transportation – timeline below. Now that the tide is turning relative to policy and design standards, we should turn some of our focus to the quality of these designs and projects. The risk is that Connecticut’s transportation design community is new to Complete Streets and will have trouble walking the walk. Civil engineers have been designing roads to car-centric standards for decades, focused on speed and flow. Many are living a suburban car-centric life, but are now being asked to design urban cityscapes and Complete Streets town centers. Can those projects be well designed with very little direct experience in anything but driving and car trips? 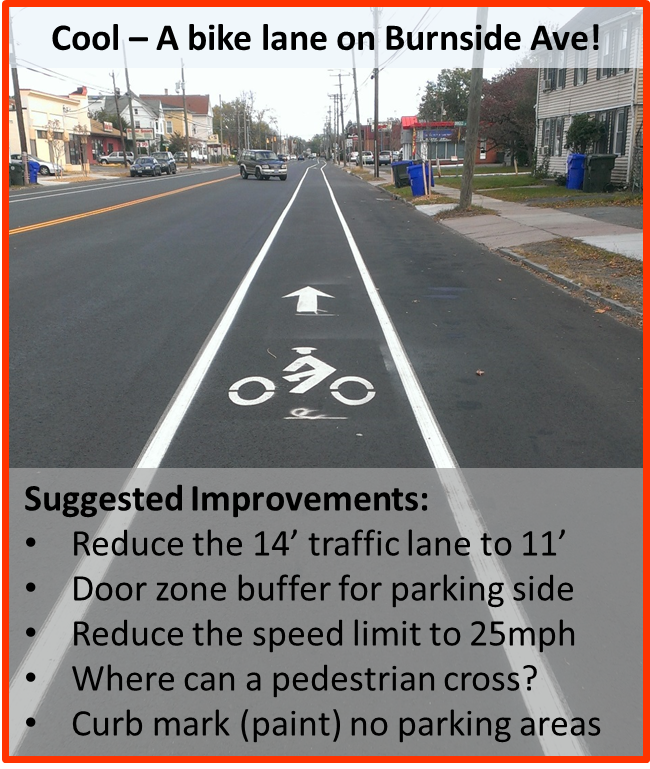 To address this knowledge and experience gap Bike Walk Connecticut held a (well attended) full day of training for design professionals and town engineers in early 2015. The CT DOT has held walking public sessions with citizens and designers working on the I-84 Redesign. In Hartford, we’ve recommended (but not yet held) a short course in bicycle safety and vehicular cycling for DPW and transportation planners – including an urban bike ride. The 2016 Bike Walk Connecticut Summit introduced a group of advocate trainees including planners to the concept of a “Walk Audit”, to evaluate infrastructure projects from outside the confines of a car-centric viewpoint. One hopes these proactive training sessions ease our transportation design community into the human-centered paradigm. (2014) Transport Hartford formed as an informal committee and Facebook discussion group focused on lively discussion of sustainable transportation – bicycle, pedestrian, bus transit, and rail. Now at 400 members! (Adopted 2014) The Connecticut Department of Transportation (CT DOT) adopted a Complete Streets Policy. (2015) BiCi Co. – The Center for Latino Progress in Hartford started the BiCi Co. program as a bicycle workshop with youth and adult DIY centered activities, training, and safety education. (2015) As part of the US DOT Mayors’ Challenge for Safer People and Safer Streets the City of Hartford formed a multi-disciplinary committee to meet monthly. The Hartford Complete Streets Action Team continues to meet each month. Reach out to Sandra Fry to get added to the committee email list for notes and meeting invitations. (2015) CTfastrak Bus Rapid Transit (BRT) dedicated line opens between Hartford and New Britain. Flexibility of the bus based platform includes routes that serve key destinations away from the backbone of the line. First year ridership exceeds estimates and expansion plans east of the Connecticut River are being considered. First studied way back in 1987 – to give one an idea how long (28 years!) major projects take to execute. (2016) I-Quilt Plan walk-ability improvements downtown and around Bushnell Park. (2016) Significant gap closures in the cross state East Coast Greenway multi-use path including key segments connecting East Hartford and Hartford. (Ongoing) Commuter Rail – The CT DOT is improving the rail corridor and adding double track to support frequent commuter rail serving Hartford between New Haven and Springfield. The rail improvements are planned to come online in 2018. (Ongoing) The I-84 Redesign in Hartford integrates the walking, biking, and transit connections that are key to urban mobility, resident quality of life, and increased safety for vulnerable users. The planning of a street redesign and the shelf life for completed infrastructure projects is long. When a road is milled, repaved, and striped it will be at least 10 years before that road is touched again. A CT DOT project may not be reworked for 50-70 years after initially built. We need to make sure the next 5 years worth of infrastructure projects are done right – and to the latest best practices already tested in other cities. 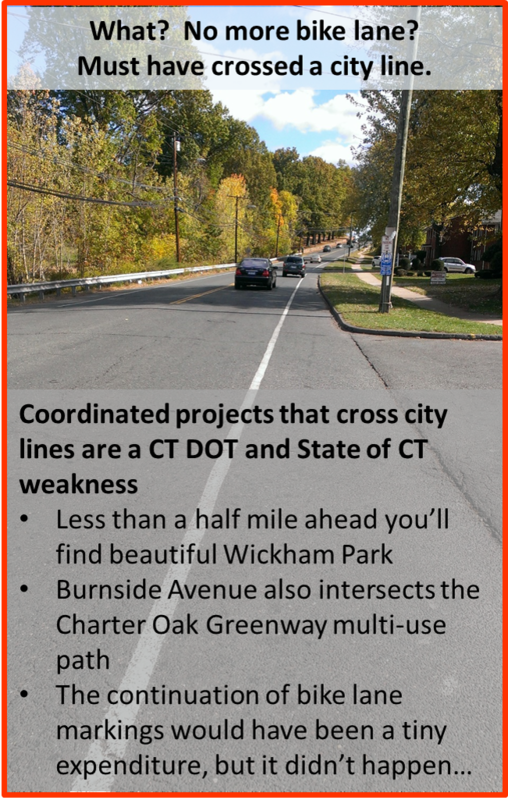 I have been riding and walking recent Hartford and CT DOT projects to capture lessons learned. This is how an agile design community would evaluate recent designs and immediately incorporate lessons learned into subsequent projects in other parts of the state. Rt. 44 Burnside Ave. Project Purpose: From 2007 to 2009, there were 6 accidents involving bicycles and 8 accidents involving pedestrians within the project limits. The purpose of this project is to enhance the safety of pedestrians and cyclists on a section of US Route 44 (Burnside Avenue) from US route 5 (Main Street) to Mary Street. Opportunity to Improve – Crashes are not Accidents. Calling a crash an accident puts the incident (usually with fault or faults) into the wrong context. These are not unavoidable acts of God. With the expectation of assignable fault we can address the causes and the behaviors that result in more than 35,000 road deaths each year in the United States. This goes beyond our design community and into the local media. If your local newspaper keeps calling crashes (or collisions) accidents, send a letter to the editor. Words matter, they directly influence our attitudes and behavior. 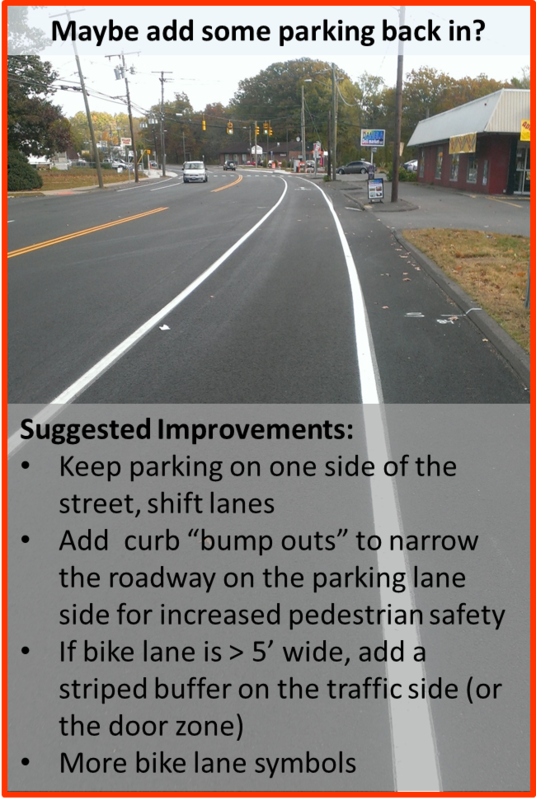 We can take a virtual ride or walk down Burnside Avenue to see how the road diet and bike lane in action. There was positive and negative feedback immediately after the road was repaved and striped, but it has since faded from the news cycle. Bicycle commuters appreciate the bike lanes, and it does result in safer driver behavior. There is still room for improvement – and room for debate. As a car-free bicycle commuter, you might not expect me to say that they deleted too much parallel parking capacity. A functional design is about balancing the design needs – in this case the transportation and safety needs of the road users and the accessibility and car parking needs of businesses. One thing I didn’t see anywhere in the project was the addition of bike parking loops in front of the businesses or at bus stops, something one might expect on a street with new bike lanes. When CT DOT does this the next time, we can avoid making the same mistakes twice. Route 44 in Hartford (Albany Ave) is an upcoming project to compare to the completed East Hartford Rt. 44 road diet. 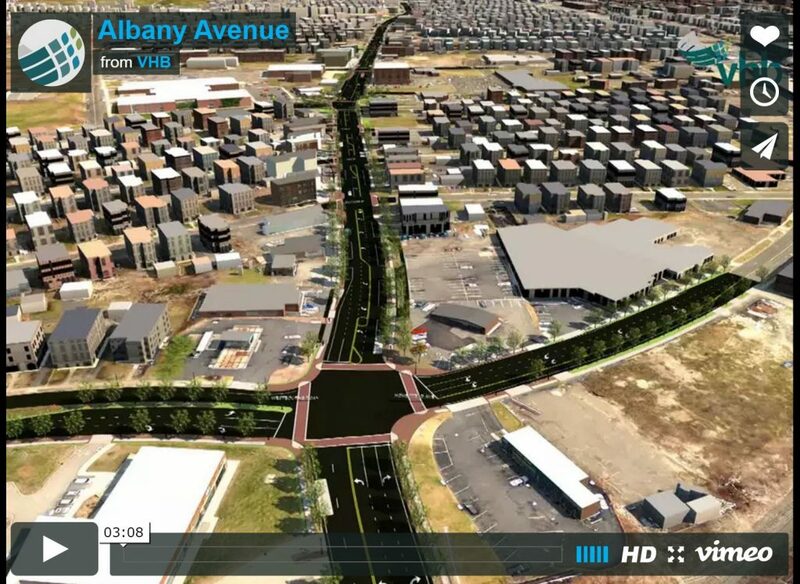 The Albany Ave. project was proposed as a Complete Streets redesign, but without bike lanes. This busy retail and commercial corridor is currently a high speed commuter traffic sewer through a neighborhood of color. Because of the high speeds, high traffic level, and large number of bicycle and pedestrian users Albany Avenue has the highest pedestrian and bicycle crash rates in the entire Hartford metro region (and perhaps the state). The design proposed will be much closer to a Complete Street, but is inconsistent with the East Hartford Rt. 44 design. Instead of adding in bike lanes, the Albany Ave design widens the sidewalks, assuming that most bicyclists will use the sidewalks instead of braving the street. If I were to make one suggestion for state routes like Burnside Ave and Albany Ave that pass through dense urban neighborhoods and retail districts, it would be to lower the speed limit to 25 mph and design to that speed level. The difference between a 25 mph crash and a 35 mph crash with a vulnerable user is immense relative to likelihood of fatality. The slower speed is also more appropriate for a busy retail corridor. 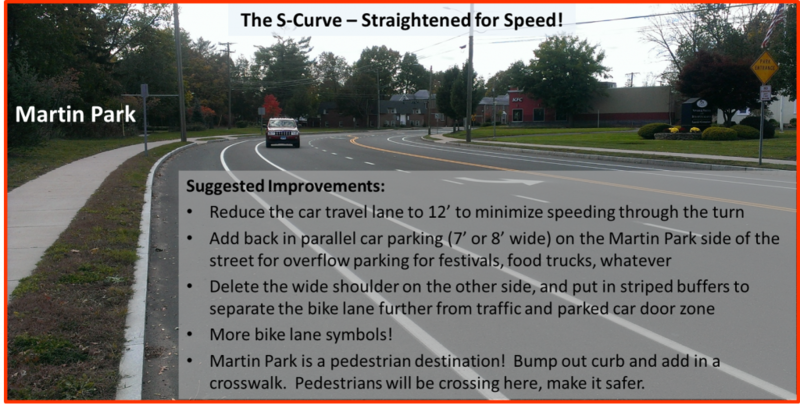 If we aren’t consistent with the design approach, at least be consistent with a neighborhood appropriate speed limit. Nearby in East Hartford is the latest addition to the East Coast Greenway. This is a welcome segment of multi-use trail connecting Goodwin College and the Pratt & Whitney campus directly to East Hartford’s Great River Park and Downtown Hartford. A bicycle commuter, jogger, or walker now has an alternative to the high speed traffic on Main Street (State Rt 5), and the trail is beautiful. The interface with the Rt 2 off-ramp is much improved over the prior arrangement, but still desperately needs a stop sign to prioritize crossing safety of pedestrians and bicycle users. A stop sign is also needed to reduce the speed of cars entering the directly adjacent school zone. The path terminates near the intersection of Main Street and Willow. Off in the distance we can see the new P&W engineering building taking shape. After receiving a $500 million state subsidy one might expect P&W to facilitate the connection of the multi-use paths that terminate at both edges of their realm. A multi-use path that follows the curve of Willow Brook and connects into the UConn stadium trail makes all the sense in the world. P&W’s bicycle commuters heading for the new green office building and their many lunchtime walkers would benefit. Unfortunately, that connection is stalled. The junction of discontinuous design and a lack of coordination of adjacent projects is obvious at this Main and Willow Street intersection. We can and should do better. 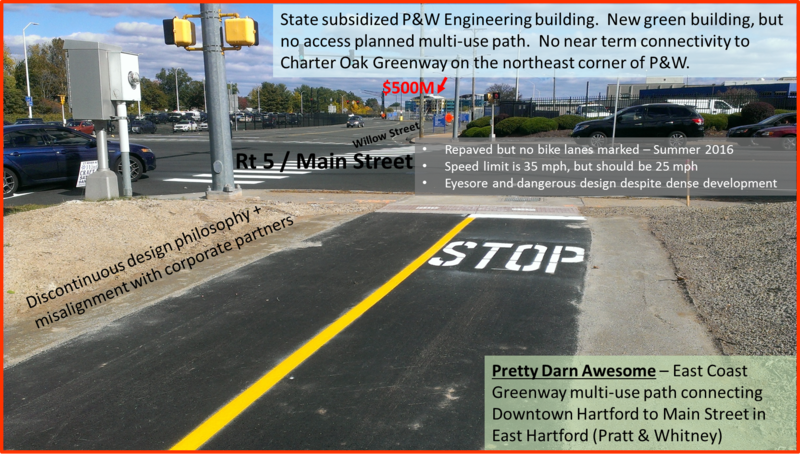 East Hartford is not alone when it comes to Incomplete / Complete Streets design. Despite the recent (2016) Complete Streets ordinance and zoning guidelines that include bicycle parking, a heavy renovation of Pratt Street (~$500,000) entirely left out bike parking. Pratt Street businesses and patrons have been asking for bike parking for years. 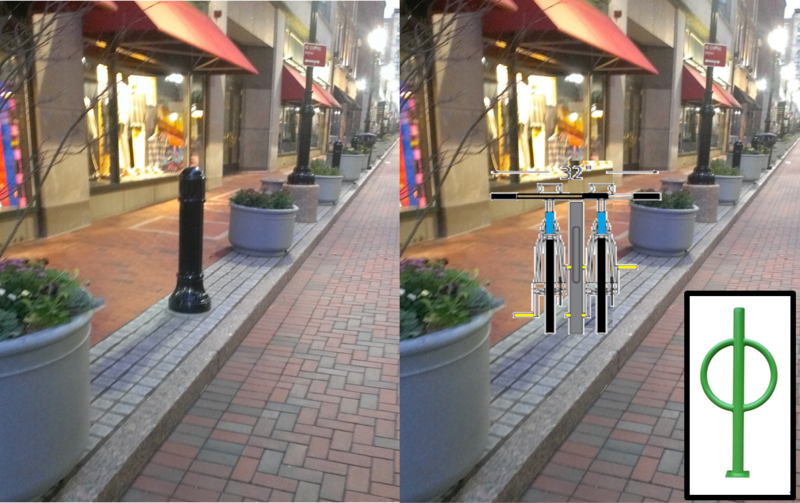 Instead of bike parking, the design firm (TO Design of New Britain) installed useless phallic bollards. How is this a Complete Street? What design company would miss the need and opportunity for bike parking on an urban street like this? The City of Hartford now has to go back and remove several bollards to replace them with modified bike parking loops. Fortunately the design overrsight did not preclude a work around fix – but at the cost of time and money to our thinly funded DPW. Hartford’s Pratt St redesign didn’t include bike parking? This is not the first time that we have looked at recent infrastructure designs with lists of lessons learned and possible improvements. All we can hope is that someone is reading and taking notes, right? Fortunately We Are Still Learning – Hartford’s Wethersfield Ave, Franklin Ave, Fairfield Ave, and Flatbush Ave.